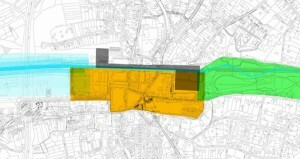 Contrary to what is assumed by its administration, we do not believe that Genk is in need of a city center. The city of Genk is a juxtaposition of rather indifferent parts developed along its main roads. Traditional notions of urban continuity are scarce and only revealed on a pedestrian level. This basic duality (extreme car accessibility combined with loops of pedestrian traffic) is taken up as the driving force of the masterplan: Slow Genk Fast Genk.